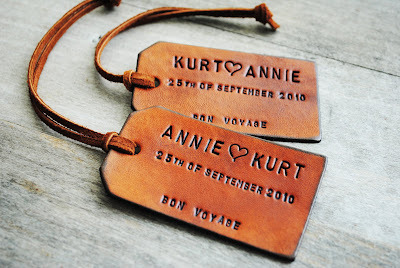 Of The Fountain: Southern Weddings Giveaway of Custom Tags! Southern Weddings magazine is currently hosting a giveaway of 2 of my custom leather luggage tags! Hop on over to their site and enter to win. :) Hey, who doesn't like free stuff?! Of The Fountain was featured in the V3 issue of Southern Weddings in 2010, and I am so excited to be part of this giveaway in 2011. The winner will receive 2 leather tags, stamped however they'd like! Congratulations! And a I'd say a double congrats is in order because I saw your tags featured on the Etsy facebook page a couple of days ago! Just entered your contest...your tags are awesome! Wow, congrats on being featured in Southern Weddings! That's very exciting.